Next week, beginning on 15 June, the Shakespeare Institute at Stratford-upon-Avon is embarking on another marathon reading of the complete work of a playwright of the sixteenth or early seventeenth century. Last year it was Thomas Heywood, the year before it was John Fletcher, but this year it is the turn of James Shirley. Dr Martin Wiggins is in charge again, and quoting from the website, “The exercise enables us to observe, in concentrated form, the development of a single dramatist’s imagination and technique, and to experience a large number of neglected plays by a significant talent of the Shakespearian era”. 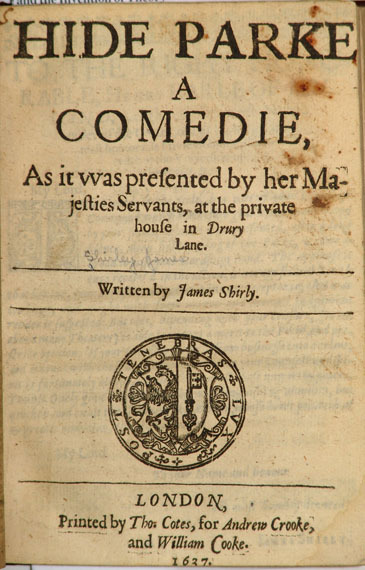 James Shirley dominated the last generation of English Renaissance drama with an industrious fluency unapproached by any other playwright during the reign of Charles I. Others, notably John Ford, wrote plays of greater power and more enduring interest; Shirley’s taste was too sure to attempt anything as memorable or extreme as ‘Tis Pity She’s a Whore. His instinct for experiment and innovation was slight, and the general ethos of his plays is the official gentility of the Caroline court: cleverly risqué but fundamentally conservative in its sophisticated decorum. But by the same token, none of Shirley’s thirty-odd plays fall below a high level of artful competence. The capable heir to greater predecessors, he absorbed their lessons into a skillful conventionality that showed how natural a certain kind of theatrical deftness had become for the English stage. The Poetry Foundation describes him as “Cleverly risqué but fundamentally conservative”, and he lived during, and survived, one of the most turbulent periods of English history. He took holy orders at the age of 24, and five years later converted to Roman Catholicism. 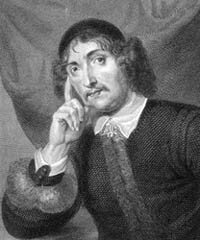 He began writing plays in 1625, the year of the accession of Charles 1, and became a leading dramatist of the Caroline stage, moving to Ireland for a time before becoming the main playwright for the King’s Men in 1640. He lived to see the monarchy restored and the theatres reopened under Charles II, but wrote no new plays, though some of the older ones were revived. He continued to live in London and it is said that he died in 1666 of fright and exposure following the Great Fire of London. There’s a fuller biography here on the Luminarium site. 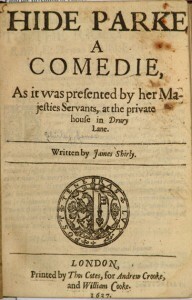 It’s been noted that his plays often feature stronger female characters than those of his contemporaries, anticipating the change to the theatre post-1660 when women appeared on stage for the first time. The Luminarium site comments: “in his time he was considered a significant exponent of “cavalier” drama; he wrote for court audiences and developed a new kind of comedy which suited that clientele, something both intellectual and refined. Shirley is a comedian of wit, and may be thought of as a precursor to the great age of Restoration comedy”. Currently a ten-volume edition of Shirley’s plays is being prepared, to be published by Oxford University Press, and the Marathon is taking place with the cooperation of the editors. The edition is the main outcome of the Arts and Humanities Research Council funded James Shirley project, directed by Prof. Eugene Giddens, Dr Teresa Grant, and Prof. Barbara Ravelhofer. Others have commented on just one aspect of Shirley’s work, but Barbara Ravelhofer describes him as “An innovative dramatist specializing in tragedy, comedy, tragicomedy, masque, pastoral, entertainment, morality, and neo-miracle… Critics still appreciate his elegant craftsmanship, his fast-paced, witty dialogues, and his detached portrayal of social manners.” The James Shirley Marathon will be an interesting investigation into the work of this neglected playwright. This entry was posted in Legacy and tagged James Shirley, Martin Wiggins, Shakespeare Institute. Bookmark the permalink.